Cruising Europe is not stepping aboard a massive cruise ship with 2,500 other people... no, we do cruising right when it comes to Europe! 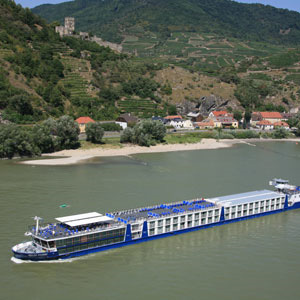 Small, modern but luxurious river ships with less than 200 people to share a journey through the small waterways of Europe, exploring small towns and villages and making friends along the way. When it comes to dining, you’ll savor your destination in more ways than one. Whether you’re planning a busy day of sightseeing or a relaxing day on board, start each day with the breakfast that’s right for you! Sumptuous breakfast buffets feature menu items that are conveniently color coded to indicate foods that are low calorie, low fat/low calorie, high fiber, low cholesterol, and high energy. Meanwhile, tantalizing lunch buffets will please your palate, and each onboard sit-down dinner features an inviting selection of appetizers, soups, entrees (including vegetarian choices), desserts, and complimentary coffee, tea, and regional wines. From the rouladen of Germany to the fine wines of France, our professional chefs will delight your tastebuds with regional specialties as well as Western favorites. And for those times when a quiet breakfast sounds appealing, room service of Continental breakfast is available in all Royal Deck staterooms and suites on our European ships. This exciting vacation lets you sample the natural wonders of Ecuador, including the Galápagos Islands and the Amazon Jungle. From Quito, fly to Coca and travel by canoe to your Amazon lodge for a 3-night stay that includes a rainforest canopy walk, a guided night tour, a cruise through the flooded forest, and a visit of Kapok Tree Tower. Return to Quito for guided sightseeing and to have your photo taken at the “Center of the World.” Next, fly over the Pacific to Baltra and transfer to Santa Cruz Island for two nights at the Finch Bay Hotel, where an expert Naturalist introduces you to indigenous plant and animal species found only in the Galápagos. Choose from a menu of à la carte activities to make this experience special to you. Then, embark on an exciting 4-day cruise among various Galápagos Islands. Have your camera ready as your Naturalist points out colonies of sea lions, pelicans, boobies, several species of Darwin’s finches, marine iguanas, flamingos, masked boobies, blue-footed boobies, frigatebirds, and other birds. Also visit the Charles Darwin Research Station—a remarkable adventure! Fantastic treasures await on this cruise vacation of Peru and the Galápagos Islands. Enjoy a walking tour of Lima; guided sightseeing in Quito and Cusco, former capital of the Inca Empire; and an excursion to Otavalo’s famous Indian market. Also visit ancient Puca Pucara, the Temple of Sacsayhuaman, the Inca fortress of Ollantaytambo, and mystical Machu Picchu. Then, fly to Baltra Island for a fantastic 4-night Galápagos Islands cruise. In the company of a local Naturalist, you’ll encounter indigenous plants and animals found only in the Galápagos Islands. Fly to Coca, where you’ll travel by canoe to your lodge in the Amazon Jungle. Spend three nights here and enjoy a rainforest canopy walk, guided night tour, cruise through the forest, and a visit of Kapok Tree Tower. Ancient ruins, spectacular scenery, an amazing variety of animals in their natural environment, and historic buildings—this vacation has it all!